Much like Nebraska’s tourism slogan, line work is honestly not for everyone. Long hours. Hot days. Cold nights. Potentially dangerous situations involving electricity. It is obvious that this job requires strength and grit with a good heart to work diligently through the darkest of storms. Our lineworkers humbly accept every thank you card, call and social media post from Dawson PPD customers after a major weather event. Others have noticed, too. 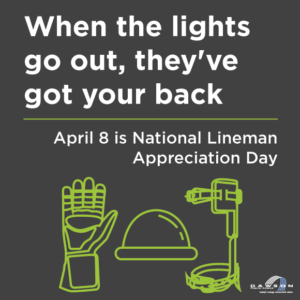 In 2013, the U.S. Senate designated April 18 as National Lineman Appreciation Day. This was a one-time resolution. In 2014, the National Rural Electric Association Board of Directors decided to permanently designate the second Monday of each April as Lineman Appreciation Day. Why would anyone want a job like this? We spoke with several of Dawson PPD’s lineworkers to better understand their why. What are the challenges to this position? You have to always be thinking ahead to what the next step is. It requires a good head on your shoulders. Describe a situation where your job was rewarding. I find it to be most rewarding after completing any job safely. I find it rewarding to be able to look back at the finished project and have pride in that accomplishment. How has your job as a lineworker helped you become the person you are today? It has made me pay attention to detail in everyday tasks. Why did you choose utility line work as a career? It’s a good job with short schooling of nine months to two years, depending on the school’s program. There’s also job availability in small communities. Seeing the progress after completing a large job is rewarding. What would you say to someone who is considering this as a career? This is a good, respectable career field to get into. I started on Dawson PPD’s Tree Crew and worked summers during high school. I thought line work was interesting because it was a job that was outside and allowed me to work with my hands. What are the perks to this position? Dawson PPD does a good job making sure we have the latest technology and equipment to do our jobs. It’s such a good feeling to see the lights come back on after a power outage. It’s nice to be appreciated when we receive a thank you in person, handwritten or shared through social media. The variety of work we perform. It’s rewarding to fix a problem and see that the customer is happy. This job has helped me become who I am by the hard work and dedication it takes to be a lineman. What I would say to someone who is considering this as a career is that line work is great and rewarding, but it’s not for everyone!